The key to diabetes is management. 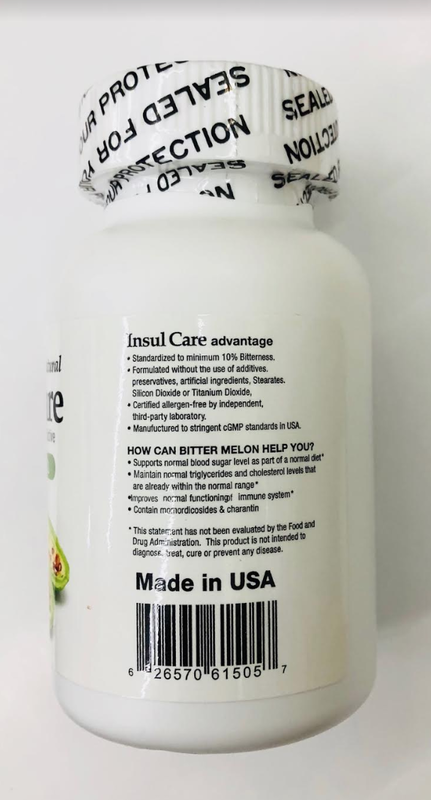 Bitter Melon abundantly contains insulin-like substance (Polypeptide P). Bitter melon notably contains phyto-nutrient called polypeptide-P, a plant insulin known to lower blood sugar levels. In addition, it is composed of hypoglycemic agent called Charantin. Charantin increases glucose uptake and glycogen synthesis in the cells of liver, muscle and adipose tissue. Bitter melon is a member of Cucurbitaceae family and the scientific name is Momordica Charantia. Among its composition, P-insulin and Charantin have received particular attention. Bitter Melon is also an excellent source of nutrition such as b-carotene, a-carotene, lutein, and zea-xanthin. It also contains a good amount of vitamin A. Diet and exercise must be done hand in hand for effective results. These statements for all products have not been evaluated by the Food and Drug Administration. Click the button below to add the Insul Care (120 Capsules) 인슐케어 - Buy 3, Get 1 Free to your wish list.